It sounds like a Bully sequel is on the way, thanks to an "accidental announcement" by Shawn Lee, the musician who created the score for the original game. 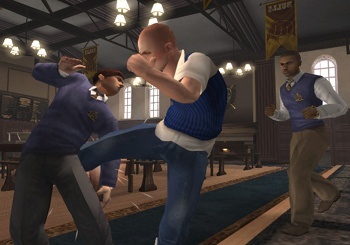 Bully, aka Canis Canem Edit, first came out in 2006 for the PlayStation 2 and while it was successful enough to spawn versions for the PC, Wii and Xbox 360, there's never been any indication from Rockstar that it was considering a legitimate sequel. Until now, that is. In an interview with The Gaming Liberty, Shawn Lee, the man behind the music in Bully, let slip that he was gearing up to begin work on a follow-up. When asked if he would be interested in working on other videogames in the future, Lee replied, "Yes. It looks like I will be doing the soundtrack for Bully 2 in the not so distant future..."
Rockstar hasn't yet commented on the revelation but Lee confirmed in an email that the company has talked to him about the game. "Rockstar recently mentioned Bully 2 to me but other than that I know nothing!" he said. So what do you think? Does Bully have the legs to become the next Grand Theft Auto (or even Midnight Club) in Rockstar's stable, or is it more likely to be another Manhunt 2?